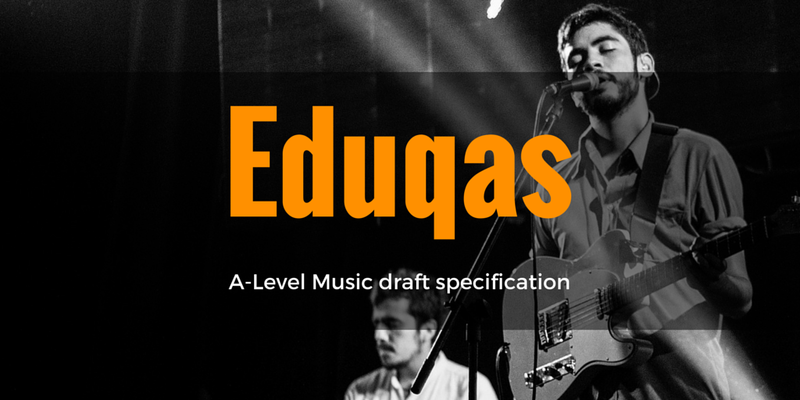 This is the final post in a series looking at the draft specifications for A-Level Music. You can find the full series of posts (including those looking at GCSE Music) by clicking here. This final post looks at Eduqas, the brand name for WJEC qualifications offered in England rather than Wales. You can download the full specification here. I must have missed something in the Ofqual requirements because Eduqas is also calling their units ‘components’. While the unit content offers no surprises, Eduqas has gone down a similar path to OCR by offering flexibility in the ‘size’ of the performing and composing units. Now that I’ve looked at each board, I have to say that the flexibility offered by OCR and Eduqas is much more appealing than the enforced equality of Edexcel or the inflexible extra weighting towards performance from AQA. This factor alone could cost Edexcel and AQA to lose centres to OCR and Eduqas. As with OCR, I find it quite odd that these units go ‘long-short-short-long’. On this occasion, it makes a little more sense if we think of it as ‘Pathway A’ (the performance heavy route) or ‘Pathway B’ (the composition heavy route) but I can still see this causing silly mistakes when it comes to paperwork. Again, it’s probably just me but the lack of symmetry bothers me a little. Candidates are required to learn three areas of study. Fitting in with Ofqual’s requirements, the first is Western Classical Music (WCM) and Eduqas has decided to focus on the symphony for this. Students (or, more likely, their teachers) pick one area of study from a choice of three popular music styles and another from a choice of either 20th or 21st century classical music. Although Eduqas has decided to include set works, they haven’t done so for every area of study. There’s only set works for WCM and the two ‘into the’ units, which means that students will study four set works. This is the only specification I’ve looked at that makes no mention of music technology or turntablism as being a valid option for performing. With other boards having been very clear about this it’s a shame that Eduqas appears to have ruled out music technology and centres will certainly want to make this a key factor in their decision making process. The requirement to link pieces to an area of study seems a shame to me as it certainly isn’t an Ofqual requirement and, for many candidates, will require them to perform pieces that may not put their best foot forward. This is probably more familiar to teachers than a ‘zero marks’ approach and it’s interesting to note that this isn’t consistent across all of the exam boards (or even within this specification since the performing unit will still adhere to the Ofqual requirement to award 0 marks to short performances). As always, I’m pleased that the free compositions require pupils to submit a brief as this approach helps to lend structure to the composing process. For example, no marks will be awarded for a response to a WJEC set brief which is clearly in a rock and pop style. Alongside the lack of music technology in the performing component, this requirement isn’t really encouraging the widest range of students to study the course. There’s a reasonable amount of detail about each area of study within the specification but not an awful lot about the conduct and administration of the exam itself, so it would be good if the board were to provide some additional clarity on this point.